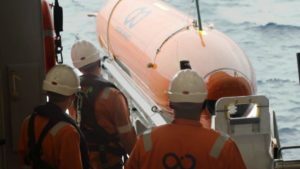 Undersea drone lost in Antarctica – W.A.P. An audacious attempt to find explorer Sir Ernest Shackleton’s ship Endurance has been called off after the expedition team lost an undersea drone beneath Antarctic ice. Endurance, which was lost in an ice floe off Antarctica more than 100 years ago, is one of the world’s most famous undiscovered shipwrecks. The Weddell Sea Expedition’s icebreaker, S.A. Agulhas II, broke through heavy pack ice to reach Endurance’s last recorded position Sunday and scientists began their search for the wreck using an undersea drone. Experts were initially hopeful that Endurance would be spotted by the robotic device, but have been forced to call off their search.